The warmer weather has finally arrived and so we spent the majority of our May Nature Study outside. 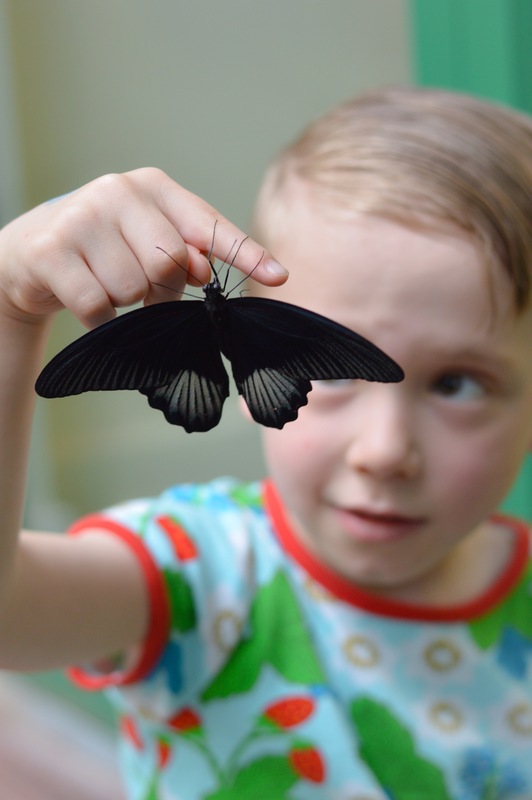 Studying insects is one of the easiest topics to do because they are accessible on almost every continent, there is a large variety and children are most often fascinated by them. 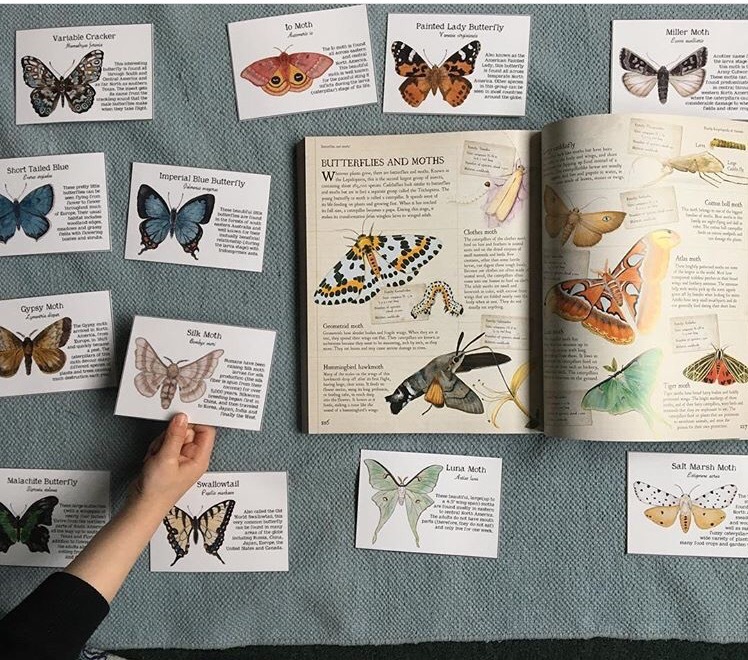 We began our study by exploring different species of butterfly with the help of these beautiful cards from Alice Cantrell of Twig and Moth. We use so many of her materials because they are well priced, printable at home and above all beautiful. We enjoyed some old favourites on the topic. This book is fantastic. The art style and amount of information are perfectly paired. We also enjoy this book and we recommend all of this series. 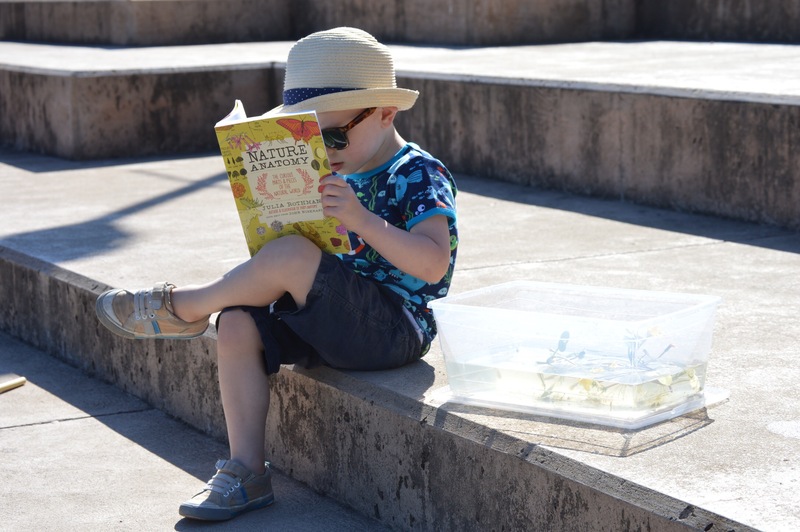 It is our favourite nature series for the 3-6 age group. 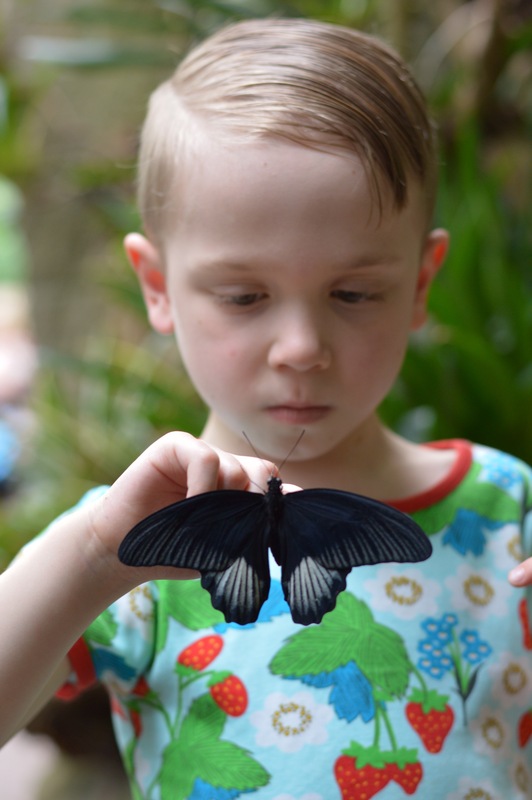 Lastly we decided to take a field trip to our local butterfly sanctuary. It is so beautiful there with so many different species of butterflies and moths. 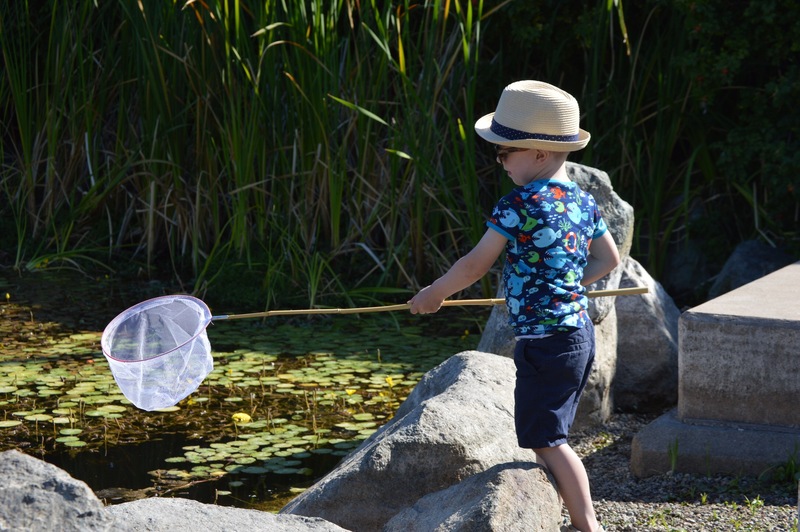 At just turned 5 Quentin now does really well on learning outings. This will serve him well as he progresses into the Second Plane of Development. 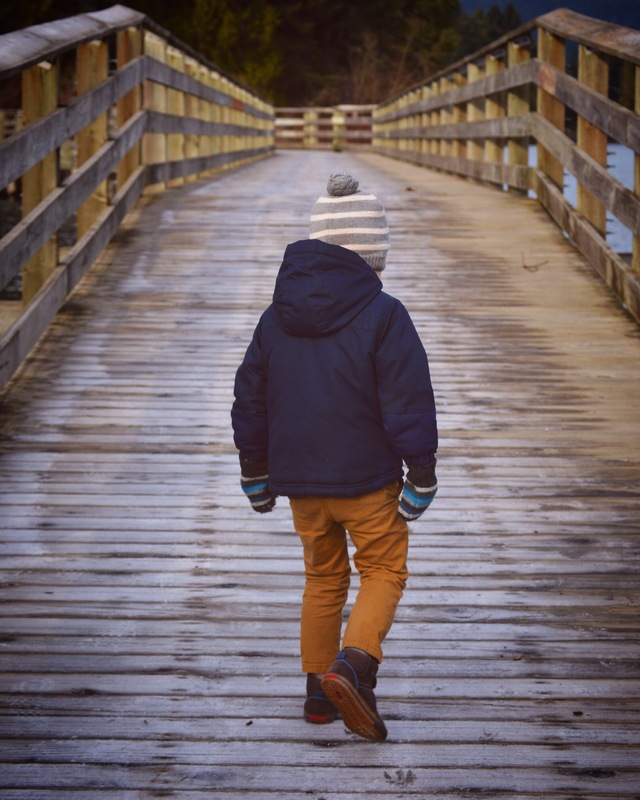 Montessori asks us to “Follow the Child” and this simply couldn’t be more applicable than when out and about. We travel at his pace, and stop when he wants to. This gives him an opportunity to really take in what he is seeing, to ask questions or to return to something he wants to know more about. 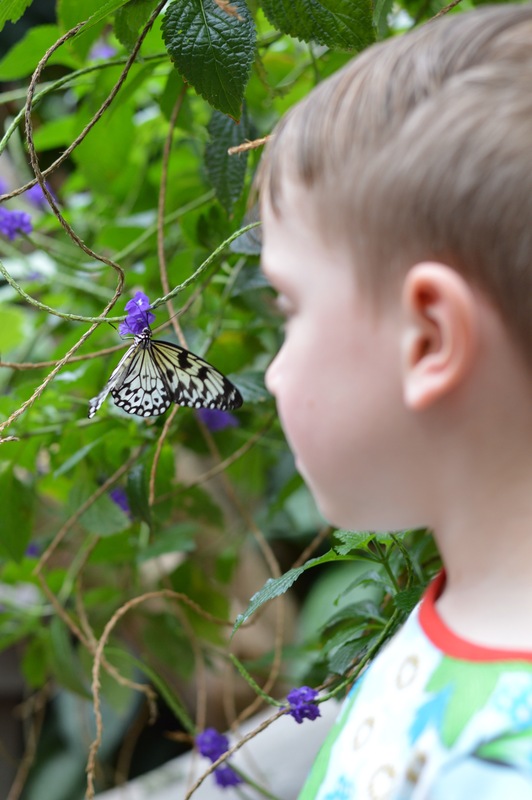 We both agreed that a butterfly sanctuary is a gorgeous spot to take photos. 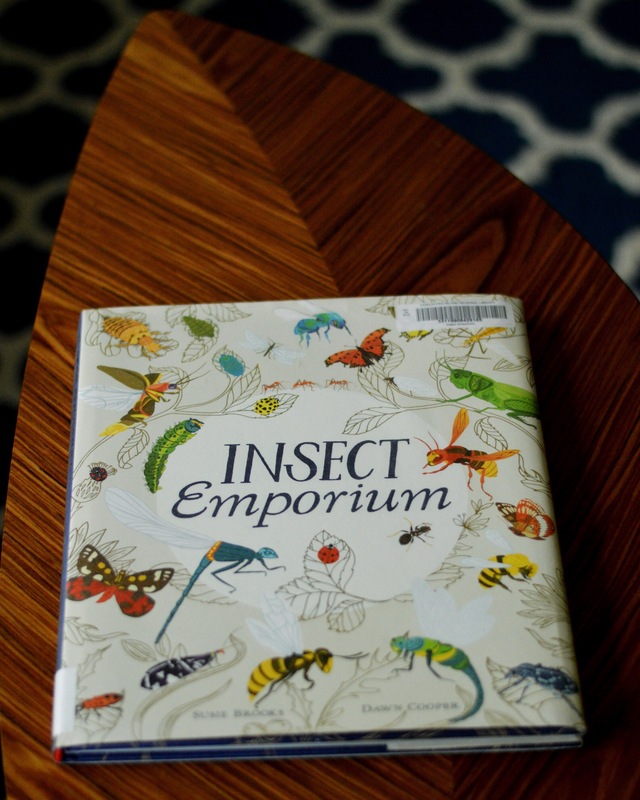 If you have been looking to start a nature study, insects is a great place to start. Books from the library, and simply stepping outside are all you need. April’s Nature Study was a favourite of mine. We love to spend time in our gardens and whether your space is a farm or a window box you can enjoy the wonders a packet of wildflower seeds brings. Here’s some of the things we covered this month. 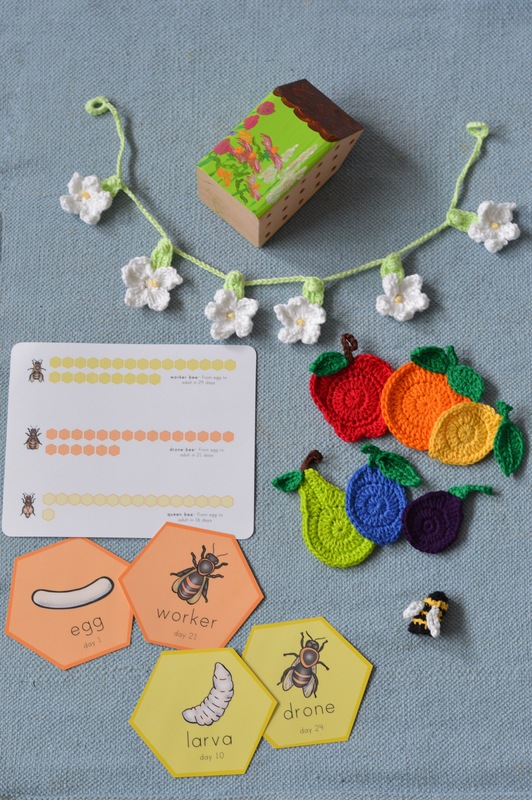 We participated in a gorgeous materials swap that brought us things that look deeper into the life cycle of a honey bee and the role of bees in fruit production. We set up a mason bee house to encourage solitary bees to come to our outdoor spaces. Solitary bees don’t sting or swarm but they do pollinate. 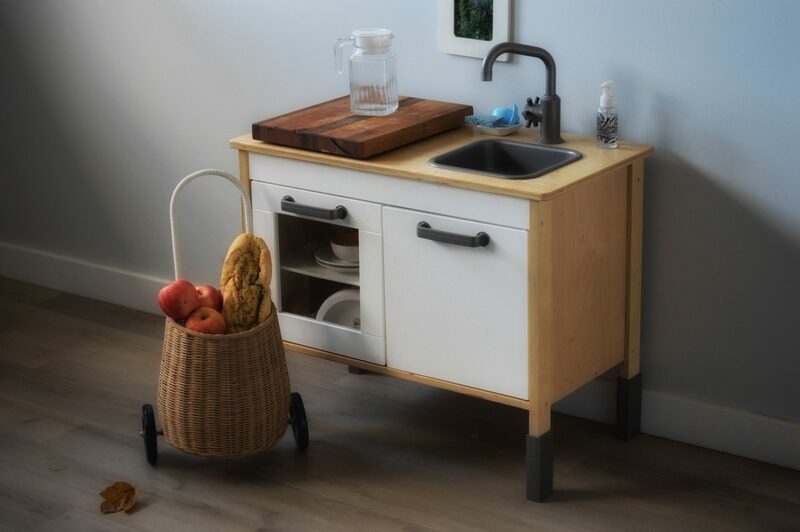 Perfect for any space. 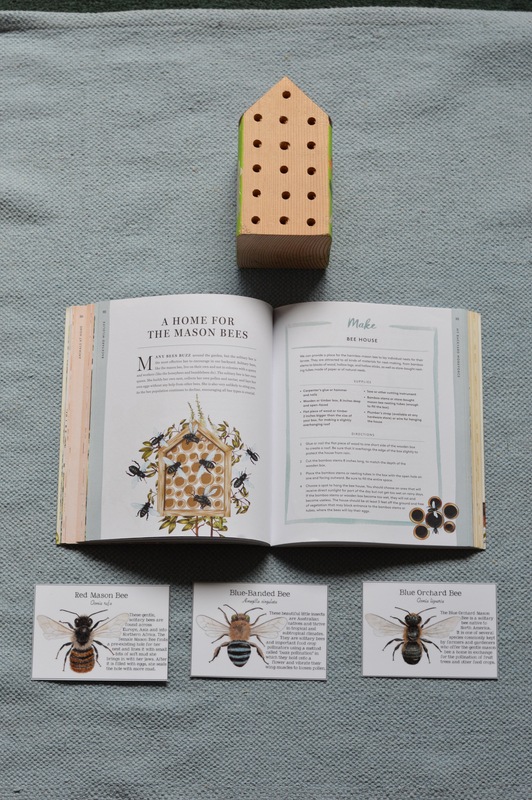 We also enjoyed learning about different bee species from around the world with the beautiful cards from Twig and Moth. 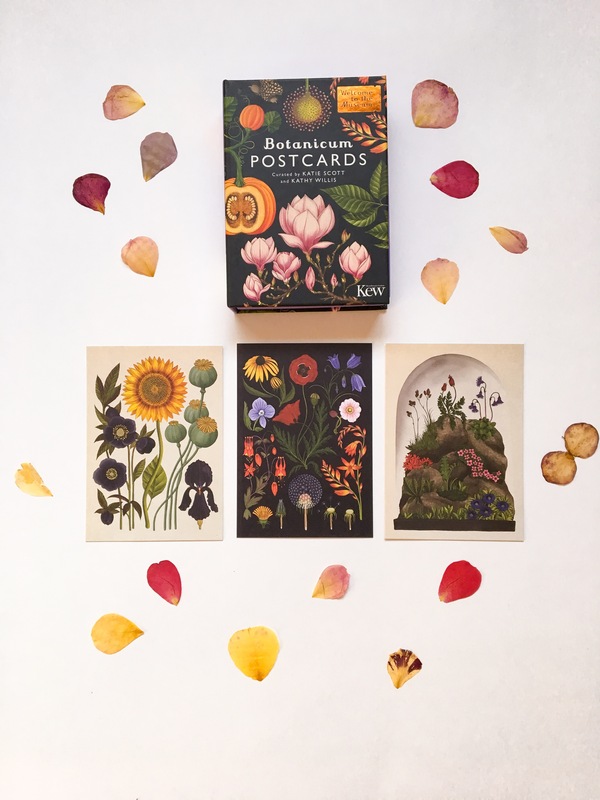 We dried flower petals and used our new Botanicum Postcards to explore other plant species. And of course we went outside. Spring is ending where we live but there are still some flowers around if you know where to look. This is one of the easiest Nature Studies to do. A packet of wildflower seeds is inexpensive and can be found at your local garden centre, some hardware stores and even big box stores. 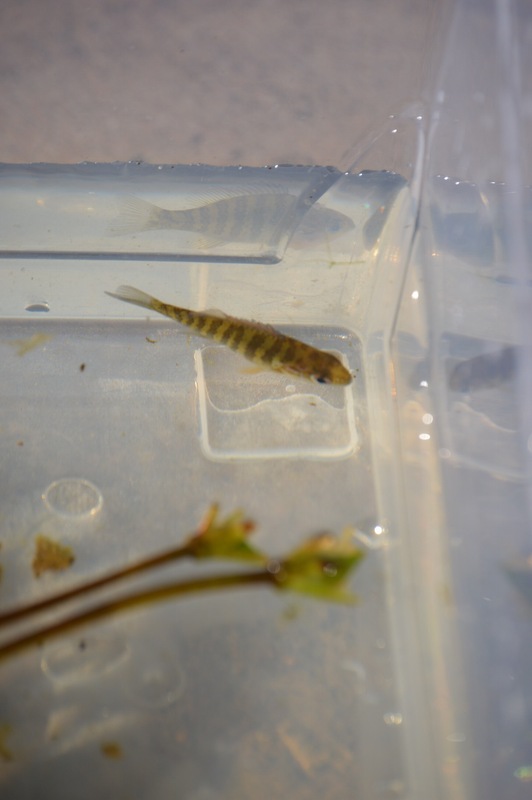 They require little care and will usually grow without any human care if you scatter them in the right place. 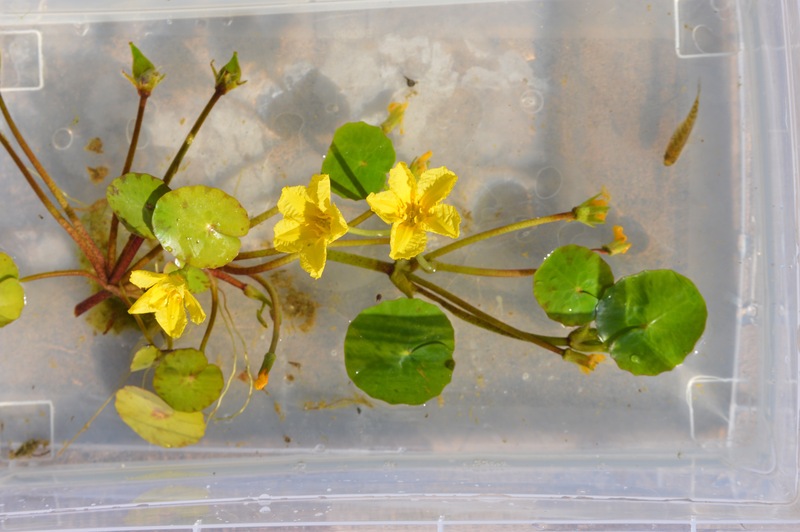 Try sprinkling them into a window box and leave a small spray bottle near by for eager little hands. 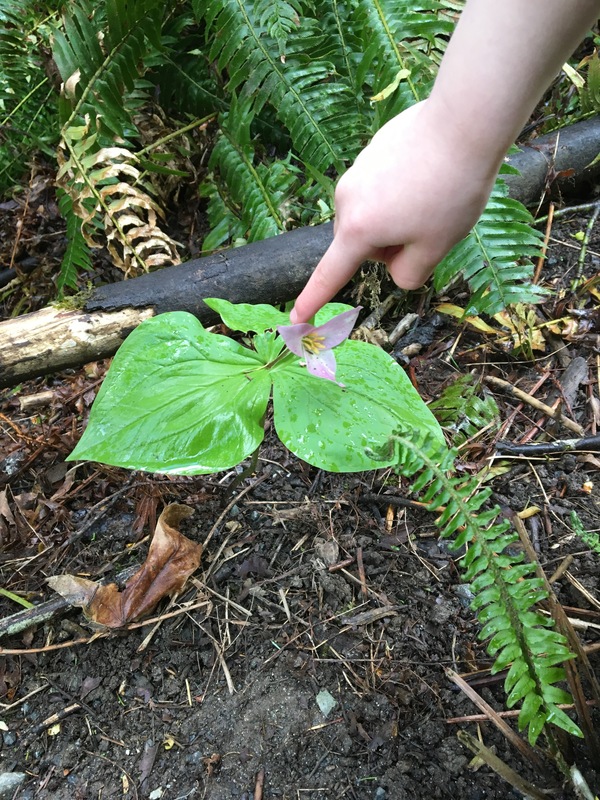 I love sharing the wonders of the natural world with a child. Even in the Winter there are so many interesting things you can open their eyes to. This month we are studying weather. 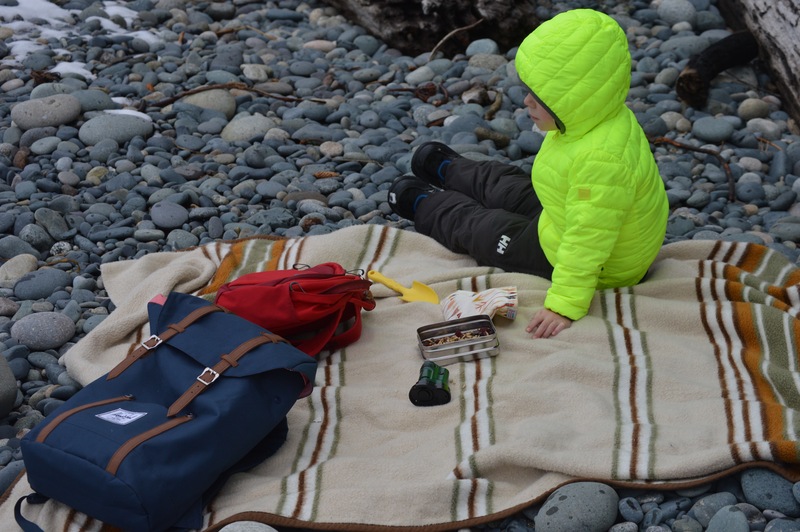 We were fortunately blessed with a freak snow storm earlier this week and as the flakes continued, we decided to pack a picnic and head out to one of the beautiful beaches in our area to observe the rare weather pattern first hand. The best part about studying nature is that it is low cost and extremely accessible, even in more populated areas. We keep a well fitted backpack for Quentin stocked with a water bottle, a note pad and pencil, some small collection containers and a magnifying glass. These things are nice to have but aren’t necessary. The most important thing is as always to follow the child. 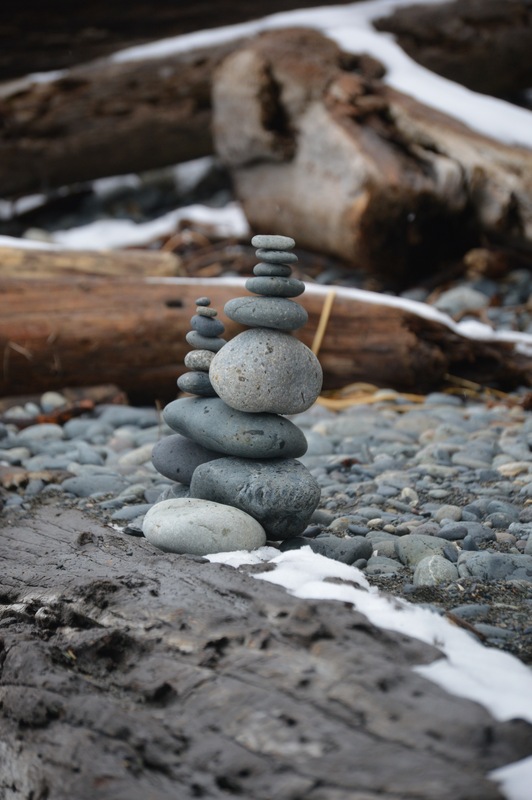 We stop when something has caught his eye like these small stone structures stacked by someone else enjoying the beach at some point this winter. Most of the beaches here are tumbled rock. We find a quiet and sheltered place under the overhang of the forest, open our picnic and watch the waves. Tides are something Quentin has experienced living next to the Pacific but we haven’t gone into detail about them yet with him. The constant crash of the waves is something he is aware of but that’s where his interest stops. Instead, we watch the snow gently fall and talk about water vapour and clouds and catch snowflakes on our tongues. I have remembered to bring our pocket microscope purchased here and we examine some of the flakes. So much detail in just a tiny flake. Nature Study is an excellent winter boredom buster. 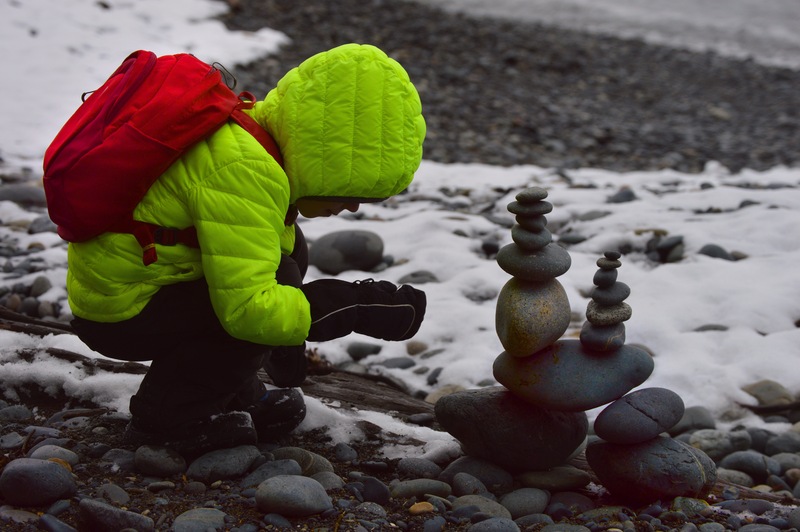 Properly bundled, going outside for even just a few minutes to collect snow for melting crafts, feeding the birds or following tracks will help children connect with the natural world in all seasons and also help them build strong memories with you. January was all about looking up into the night sky. We gathered some simple DIY materials and borrowed some books from the library. I love it when nature studies are simple. No special materials required, although sometimes they are nice to have. It’s really just about appreciating what’s around you. We use this book for our monthly nature study. I made some constellation tiles with some inexpensive wooden discs from our big box craft store, my electric drill and a fine tip marker. Quentin loved shining the light through the holes to make the constellations appear on the walls. It was a truly hands on experience for him and he quickly learned the name of some of the constellations. 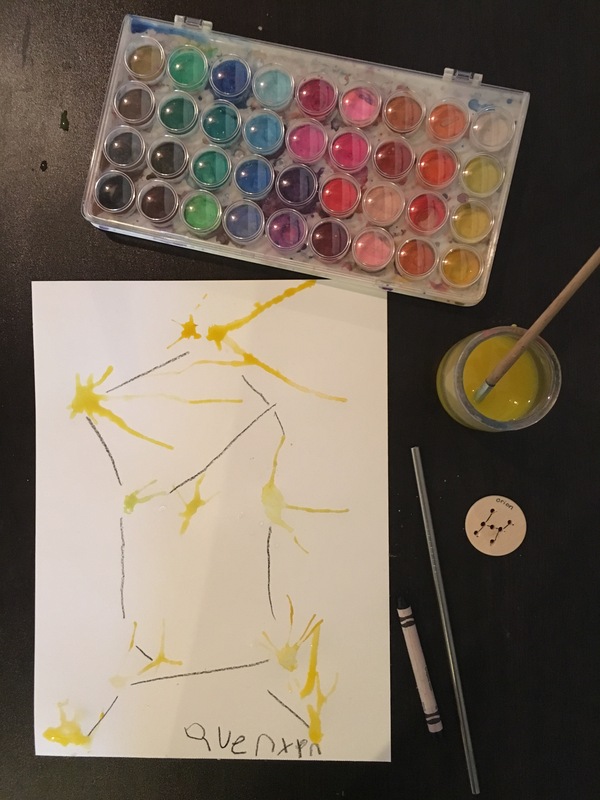 I set out an art invitation of making constellations with some watercolour paint and paper, a straw and a black crayon. Quentin greatly dislikes product art and it is not recommended for children under 8 years of age. Instead, its all about the process. The invitation held the prepared materials and he chose where to put his paint, how to blow the paint through the straw to get the affect he wanted, how to connect them and most importantly when he was finished. He sat for a moment looking at it, then went to get his Orion disc and found they were similar. 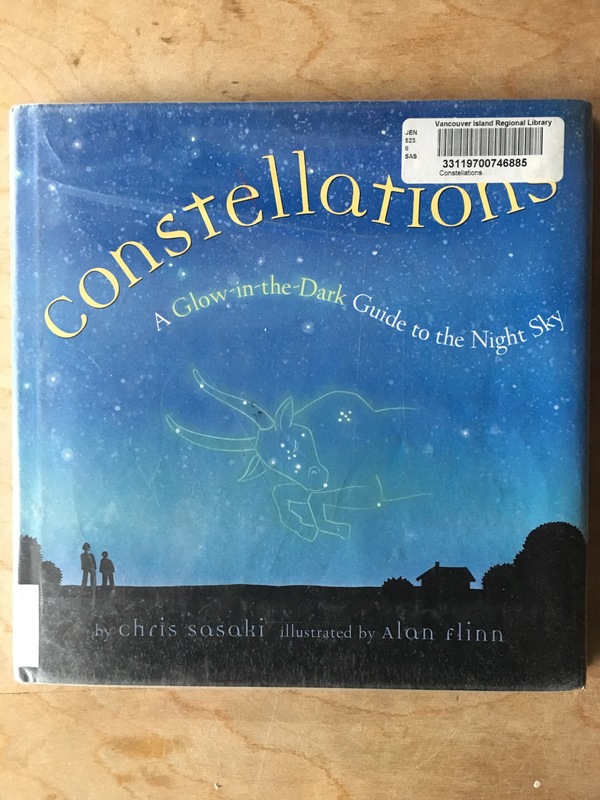 This book was absolutely fantastic as an introduction to the stars. 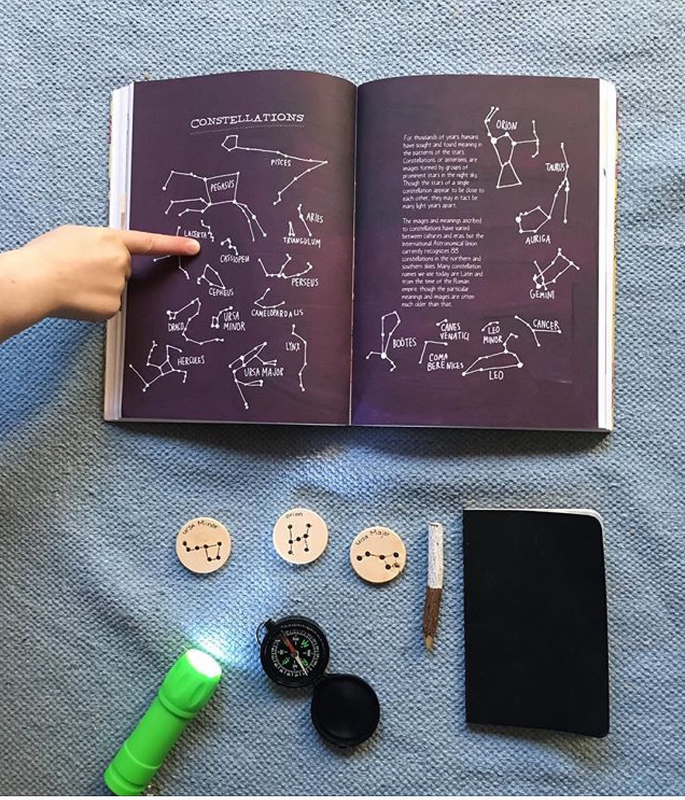 It gave a brief history of how each constellation got its name and Quentin loves turning off the lights to see the book glow in the dark. 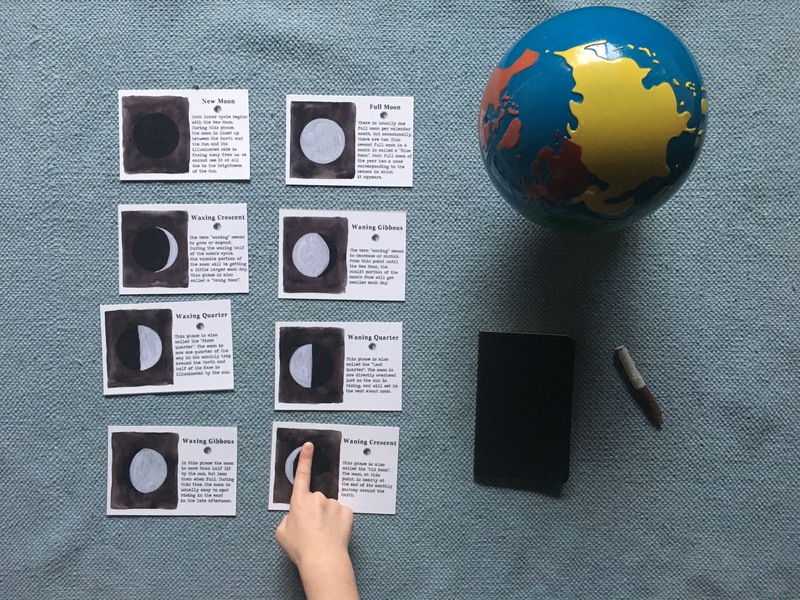 We used our beautiful Moon Phases cards from the unbelievably talented Alice Cantrell to learn some new vocabulary and interesting facts. Lastly we bundled up, packed a warm blanket and a thermos of hot cocoa and went out into the night to observe the differences in the moon phases and the brilliance found when we stop a minute and stare up at the night sky. The celebration of the return of the light. 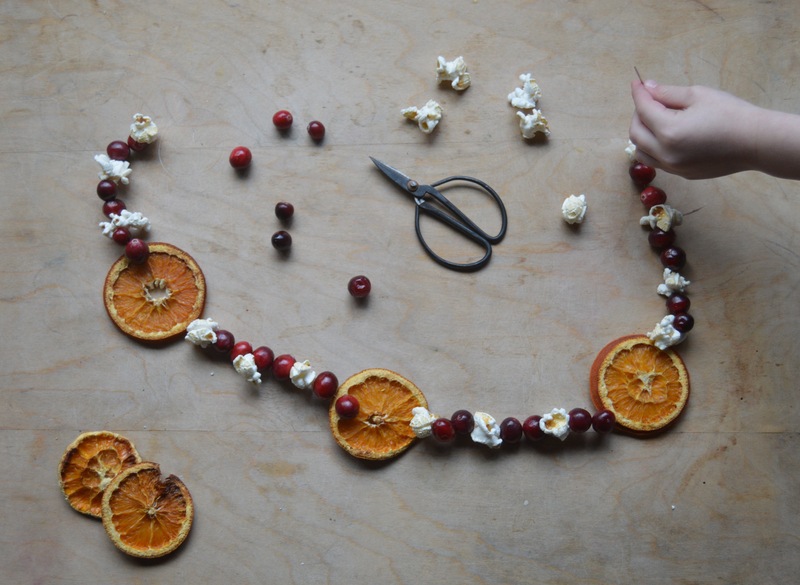 This is the time of year we focus on simplicity. When commercialism seems to be pushed just a little bit more, we instead look to tread lightly. 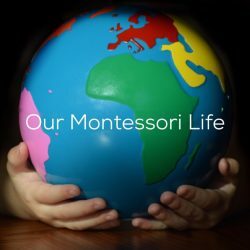 It’s a time when Montessori Grace and Couresty have an intent focus and when Peace Education is at the forefront. Making Nature garlands as a treat for our local birds is an excellent way to practice sewing skills for little fingers. We use a tapestry needle for easy grip and sharpness. 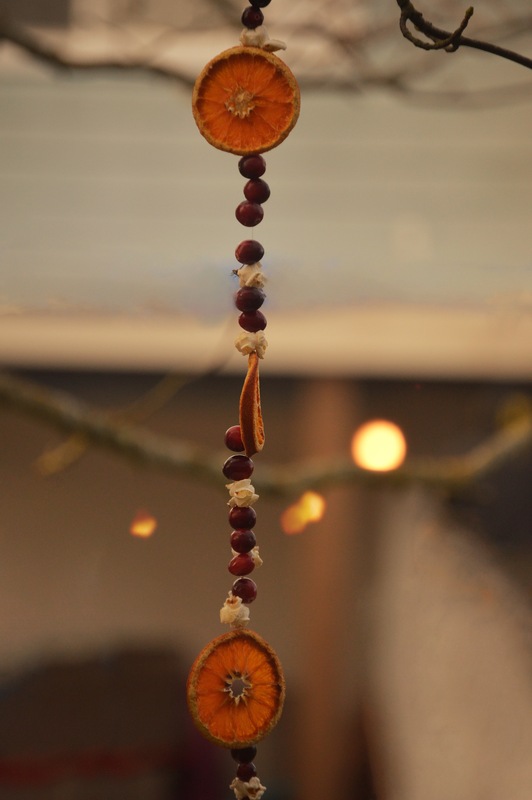 These can be modified so that even a toddler can help and they make great gifts to bird and nature lovers. 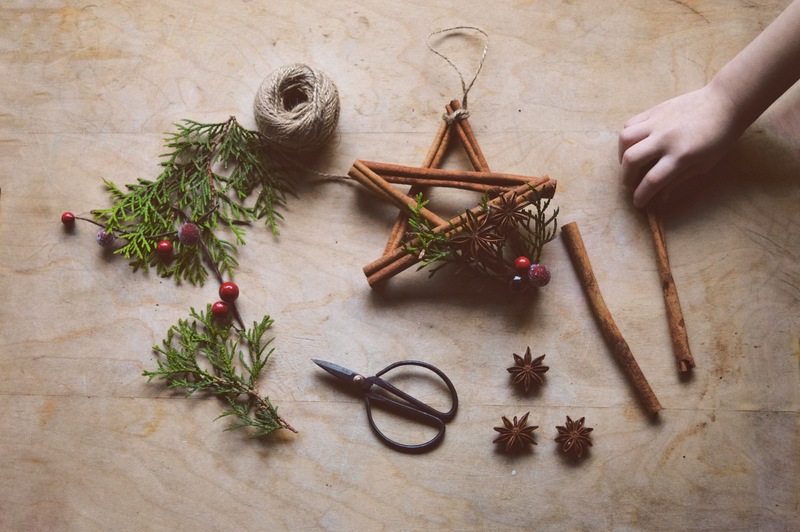 Cinnamon Stars are easy and perfect homemade gifts. Quentin has been using the hot glue gun for years now but if this is your child’s first time using one, we recommend giving a lesson first and hand over hand helps keep little fingers safe. The stars look beautiful attached to the outside of a package too. 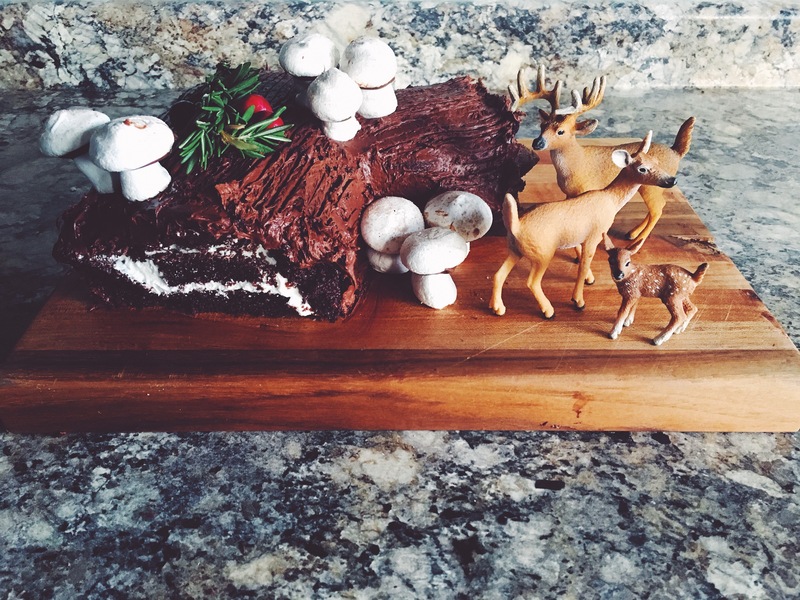 A homemade Yule Log is a classic favourite. Quentin loves making the meringue mushrooms. Nature walks on cold, crisp mornings offer a chance to follow animal tracks and see the changes the cold brings to the natural world. 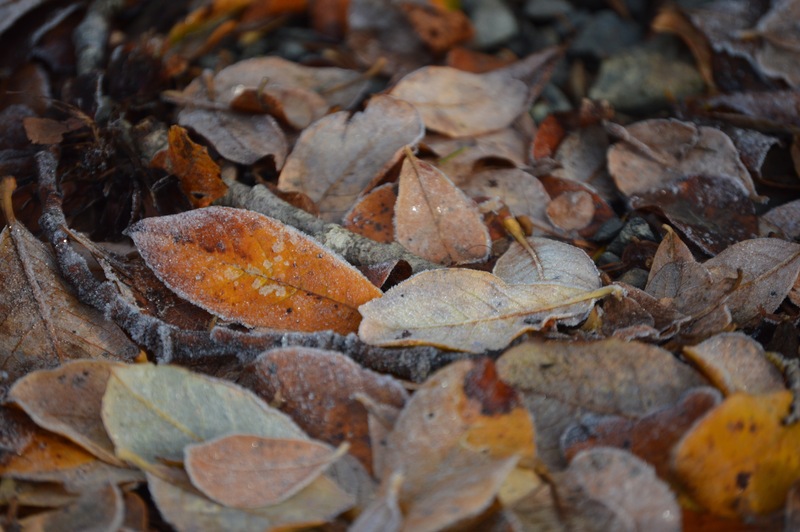 On this walk we examined frost patterns on leaves and watch some ducks test the ice before going in. We love books in this house and Solstice wouldn’t be complete without curling up together for read aloud times. 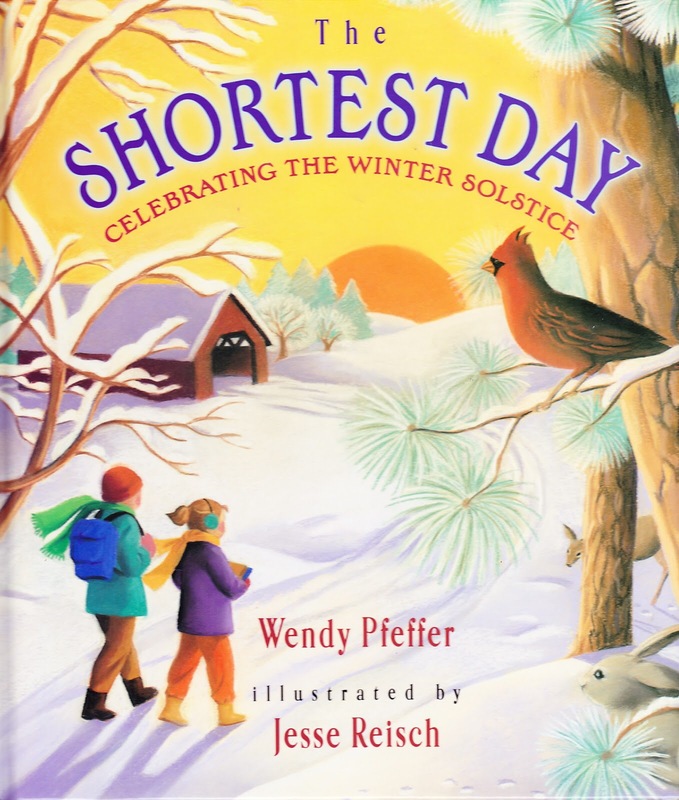 This book is our favourite non fiction Winter Solstice book for the 3-6 age group. I use it in my classroom and we have used it at home since it was published in 2014. This book is also lovely. We enjoy different fables from around the world and Quentin loves making the connection of where the fable originated to the region on his world map. This one has been a favourite of our house for years. 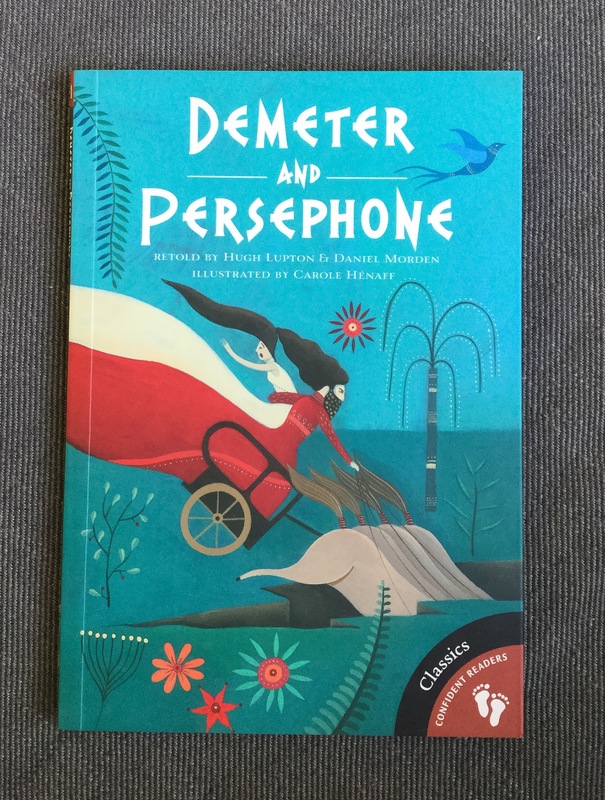 We began reading it with Anthony on Solstice night years ago and Quentin now enjoys it although it is very much intended for a child in at least the Second Plane of Development. Lastly we all sit as a family and light homemade beeswax candles and listen to this amazing Canadian taken all too soon singing about the above fable. 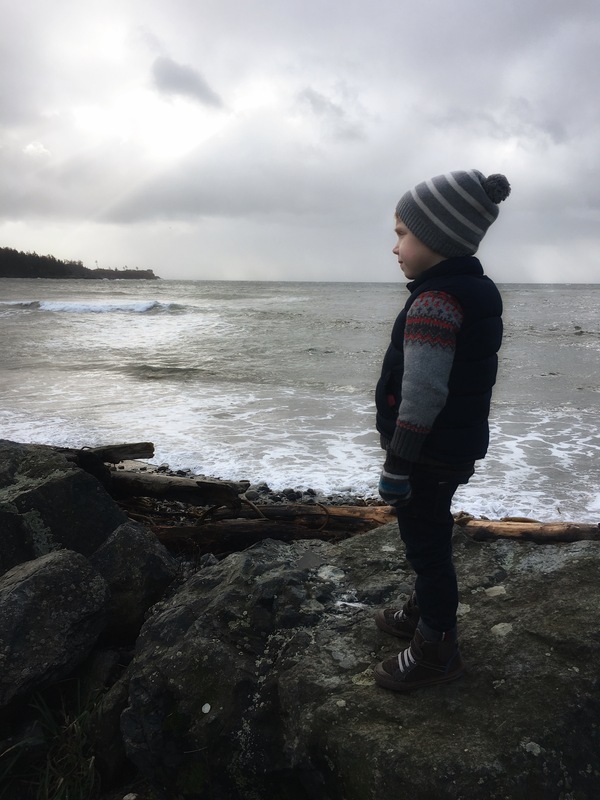 It is a beautiful song of a mother’s love for her child and has been Quentin’s favourite since before he could walk (if you follow us on Instagram you may have seen him sing it). As the afternoon sun fills our house on this the shortest day, we hope that whatever your family is doing in December, it is restful, peaceful and joyful. November has seen our Nature Study really take off. It took us a few months to find our rhythm. I wanted to be sure it was not forced and that if flowed holistically into what we were already doing. We are often exploring nature anyway, but this has given us a better direction and given me an overview to prepare materials from. 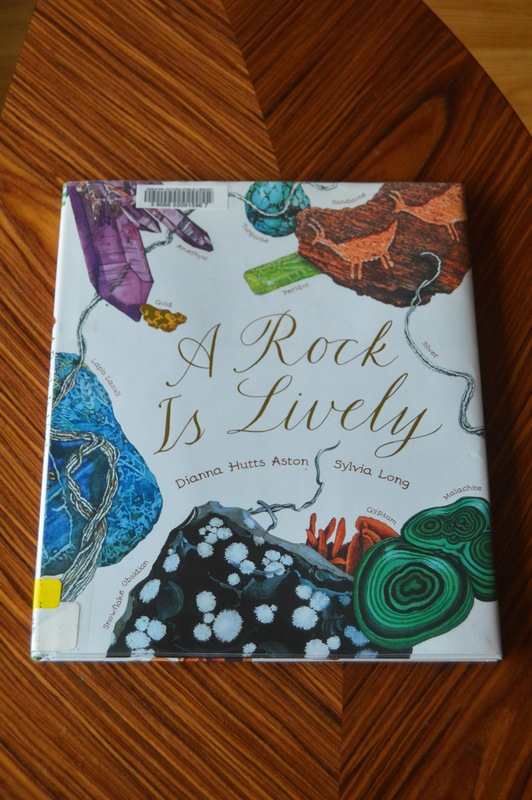 Here’s a glimpse into our November study of rocks, minerals and fossils. 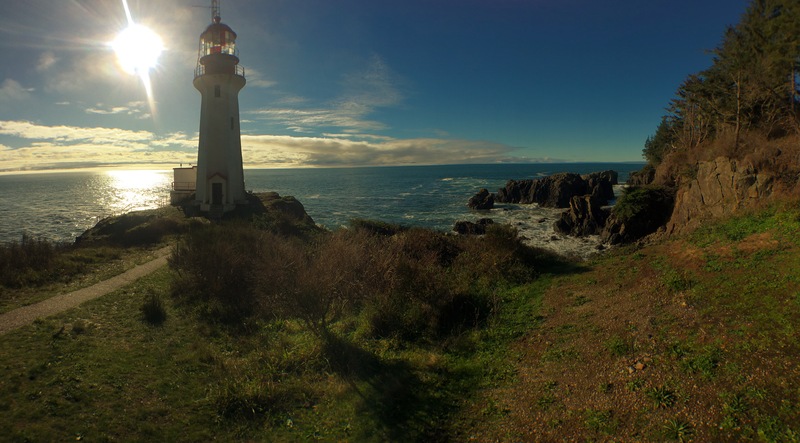 We travelled to one of the local lighthouses to get up close to some big rocks. We brought a picnic and made a day of it. It was windy but we were well bundled. We spent the day at our local museum getting up close and personal with a mummified baby mammoth, looking at ammonite fossils and adding to our gemstone collection. By the way, he’s holding cookies here. 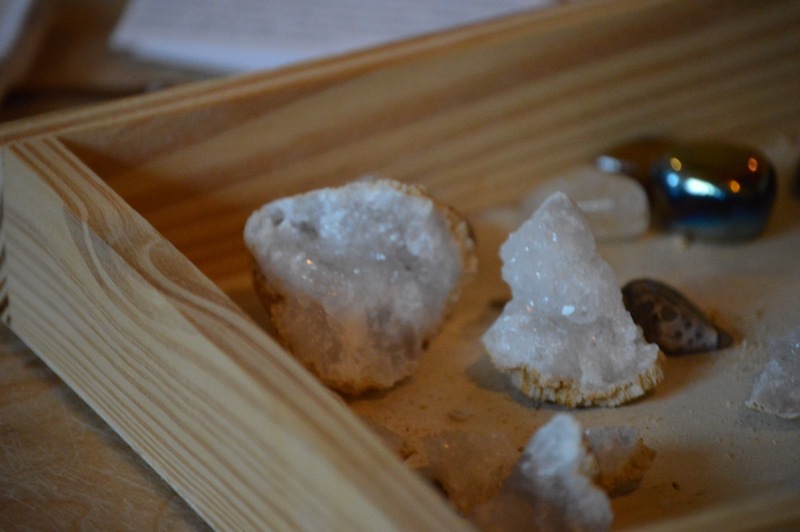 His newly acquired quartz and amethyst crystals are safely in my bag. 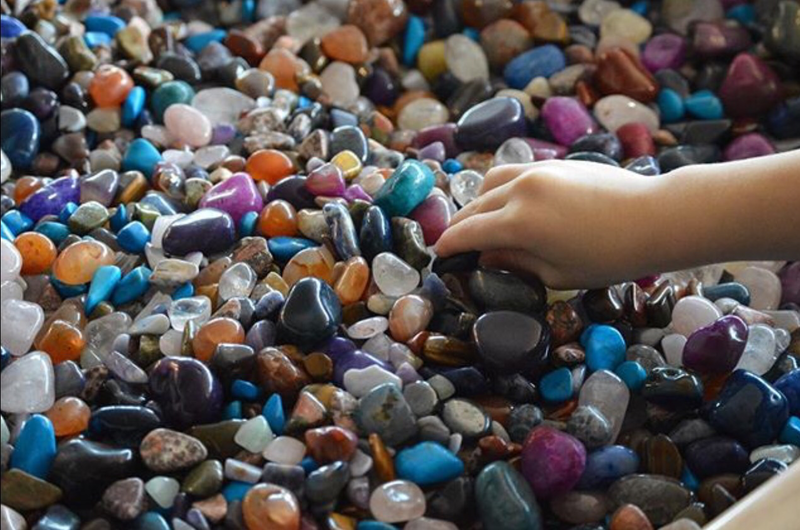 We went on a field strip to a gem and rock shop in search of treasures to add to our newly formed gemstone collection. This was an unexpected pleasant surprise. The staff there were incredibly kind to us (you can read about our experience here). I hadn’t expected Quentin to be as engaged as he was there and I highly recommend looking into your own local rock and gem store for interesting materials to add to your home or school environment. 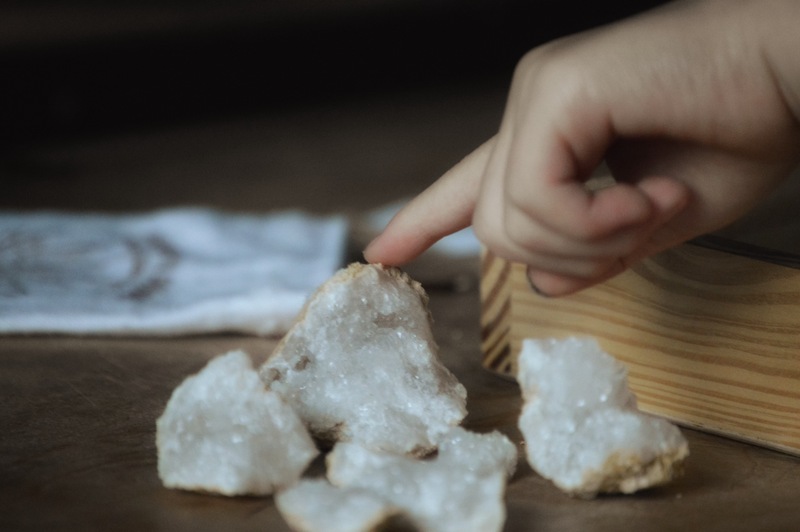 Last week we added geodes to our Nature Tray. Quentin loved smashing them to find the sparkly centre. This took a bit of help from me. Mostly to guide the hammer. It made me think of how to make a meaningful hammering Practical Life work for him. We took out many different books from the library over the month, but this one has always been our favourite. Quentin loved matching is own specimens to the end pages. 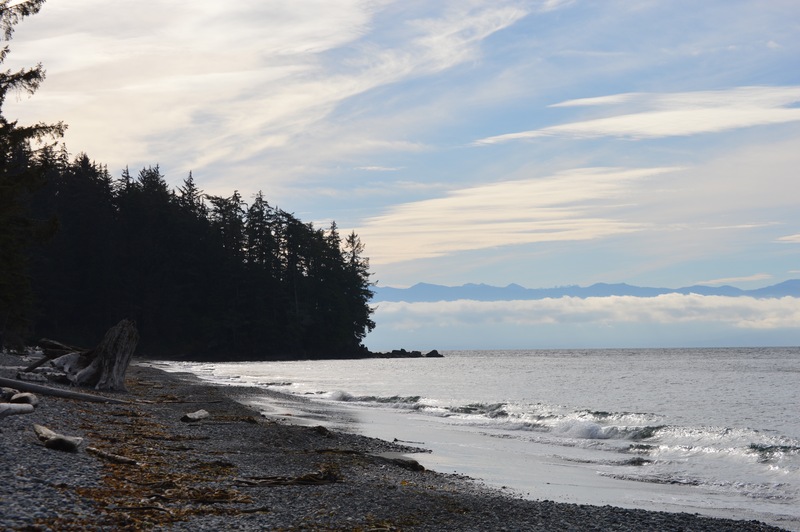 Today we finished our study by bundling up, packing some snacks and heading to our local beach. 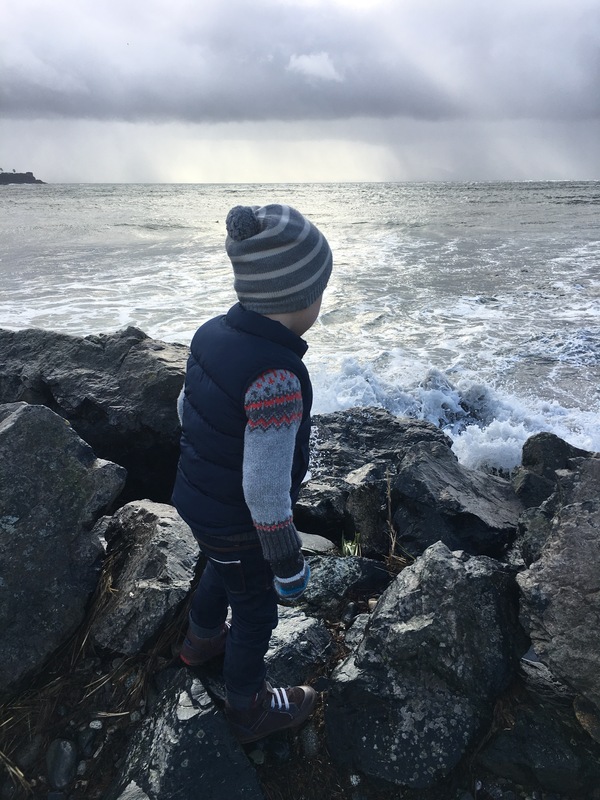 Quentin observed that the rocks were most likely granite but he was also cautious and curious of the waves. As winter approaches so does the storm surge in the Pacific. It has been such an amazing month. 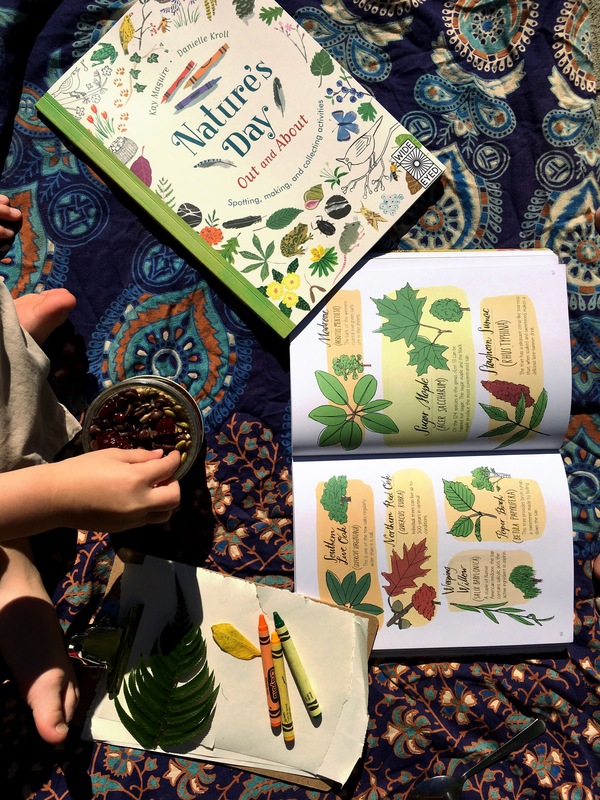 As we pasted some mementos into our nature journal and slowly filled the page with watercolour, we looked back on a really wonder filled month. And that’s what it’s all about isn’t it? Tending to the fire of awe and wonder burning within the child. If nature study and nature journalling are new to you, go slowly. Take your time, pick a topic that is easily doable in your area and as always, follow the child. We are studying rocks, minerals and fossils this month as part of Nature Study found here. We decided to go and find some big rocks. We are lucky enough to live in a place where we can easily find them. The caution sign is not to be taken lightly. He’s standing in the edge of a 60 meter (200 foot) drop. 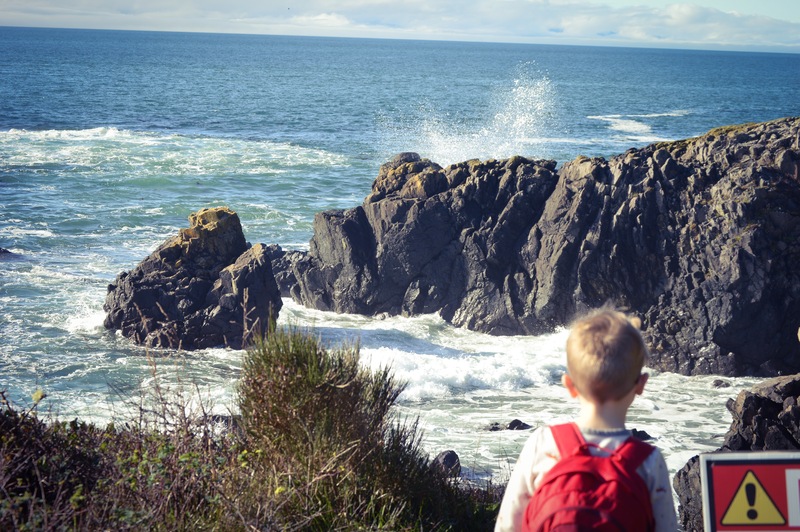 Getting out and exploring is so much more fulfilling for a child than simply looking at images in books or on media. 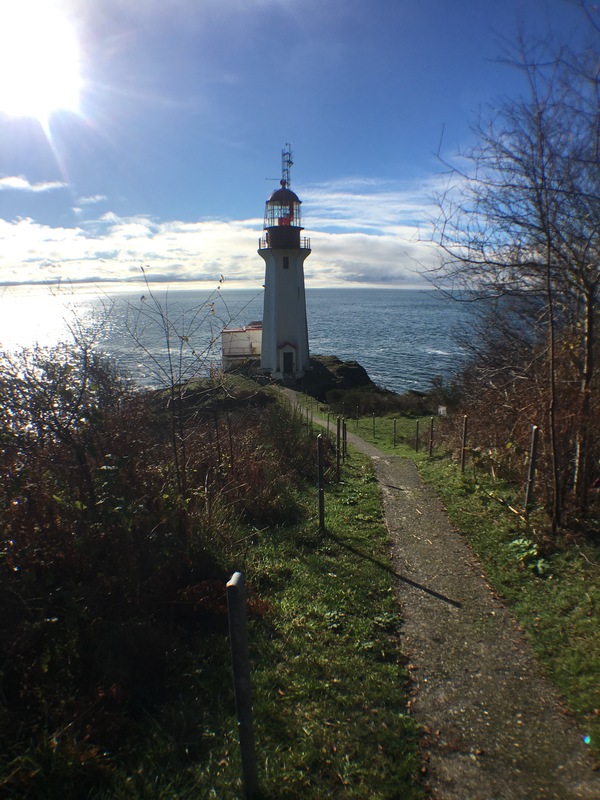 We took our time, brought a picnic lunch and enjoyed this rare sunny November day. Adventuring doesn’t have to be difficult. A bag with snacks, a blanket, pencils and a notebook are all you need. Instead of the same old trip to the park see where else adventure might lie close by. If you have a favourite destination, big or small let us know. We’d love to feature your story. For the month of October we are studying trees. We live in a perfect spot to do this. Lately we have been observing the differences in bark, counting tree rings and classifying leaves. Quentin was feeling unwell today so I thought we could do something a little different while keeping with our theme. 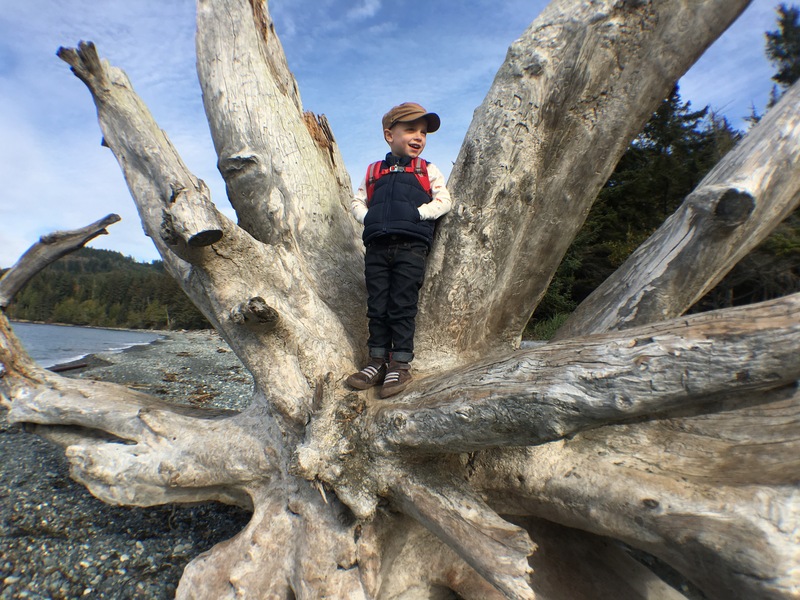 We went in search of some big drift wood. And when I say big, I really do mean it. Standing on the root system of a giant tree, he surveys the world around him. The picture is deceiving. I had to lift him up and he is standing higher than I am. 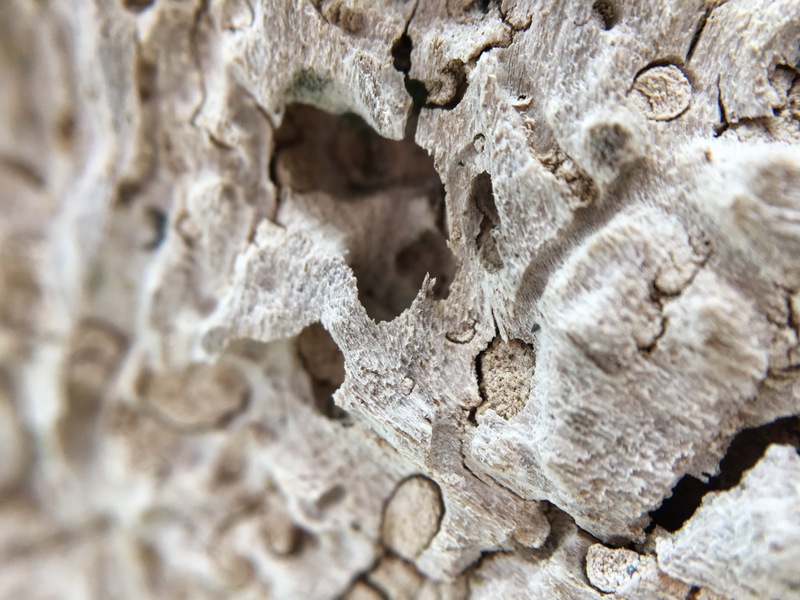 We also used my Olloclip to get some macro shots of the tree. We observed what the salt water had done to the wood. 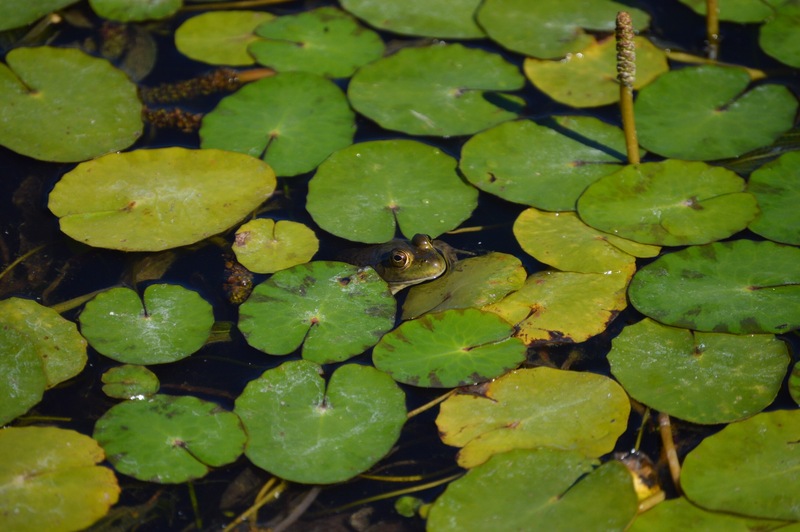 If Nature Study is something you’d like to take up, try starting small and simple. 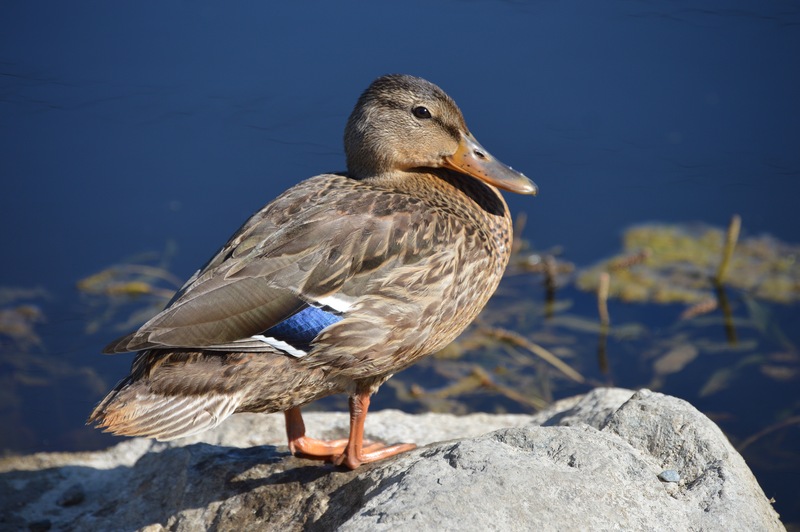 Nature can be found in both rural and urban areas. 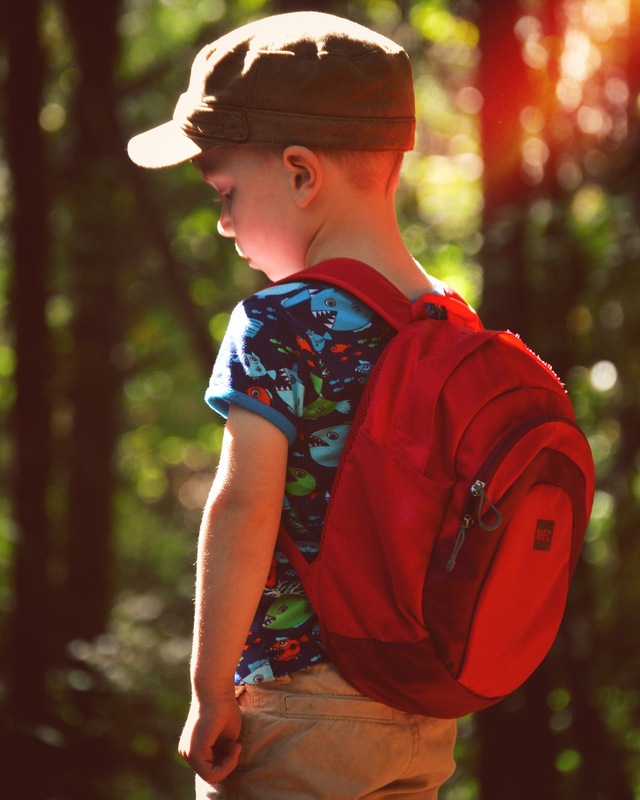 Pick a topic that is easily accessible to you, get some complementary materials and allow yourself and your child some uninterrupted observation time. September is always such a busy time. Back to school, work, extra curricular activities. The weather changes and we notice a change in our home too. We try to be more mindful, and take things slowly. It’s a challenge, but it means so much to the boys. It’s the small things that make the most difference. We change our rhythm, when the mornings are still dark at the sound of the alarm clock. We add in candles and quiet sitting on the couch together as the house darkens at the end of the day. We make more time to go slowly, gently and to be mindful that even though the days are a little colder and a little shorter, it is still important to be outside. 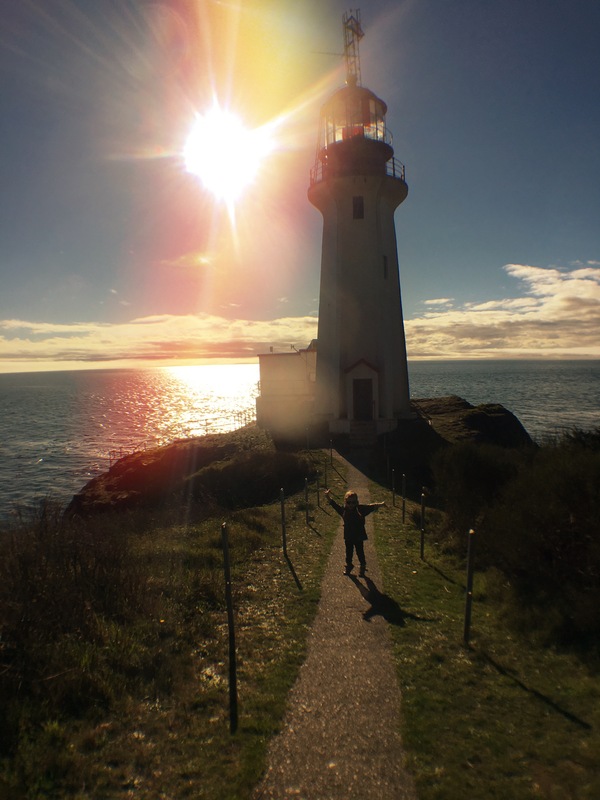 If you have been following along on Instagram you will have seen our nature study adventures. 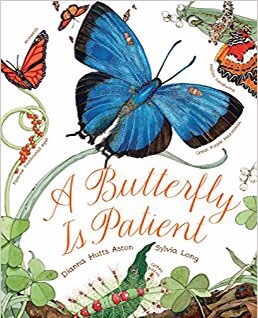 We are using this book because it is so perfect for Montessori families both homeschooling and otherwise. 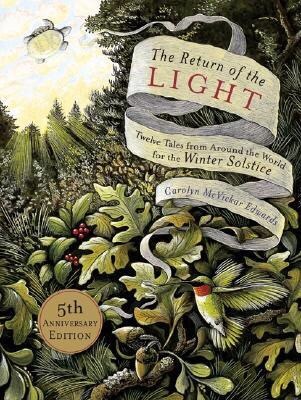 I stumbled across Calli at Sparrow and Lilies and her absolutely excellent companion Nature Study to this book. We needed something to ground us. To focus us in a gentle way while opening up the world of nature study to us. This is perfect. And better still, it’s free. 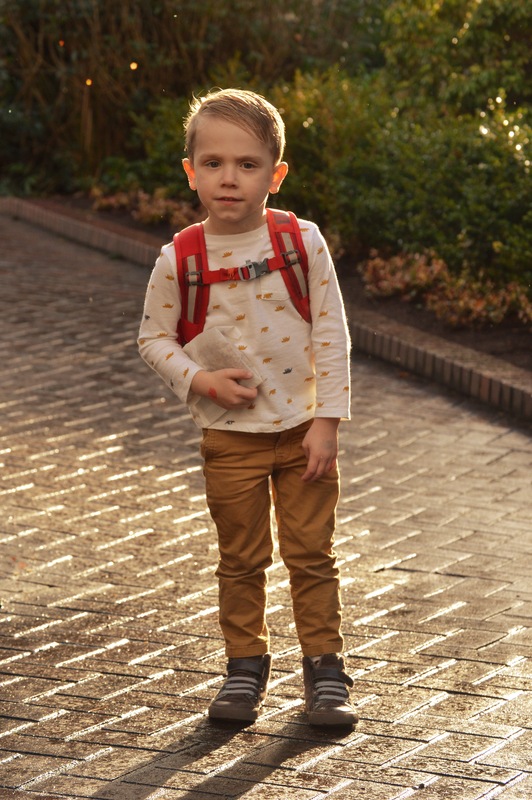 Quentin returned to school for his 3rd (already!) year of Casa. We make a point not to have the classic Montessori materials in our home space as he uses those all week at school. However, we have added some materials to his space that reference the change of seasons. 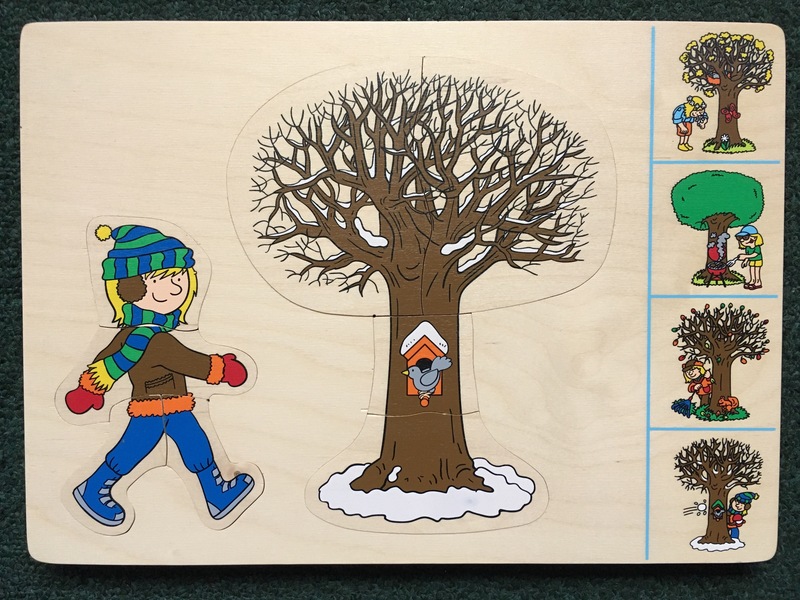 This layered seasons puzzle is still popular one year after getting it. I love that it has the control of error on the side so the child can check their work independently. 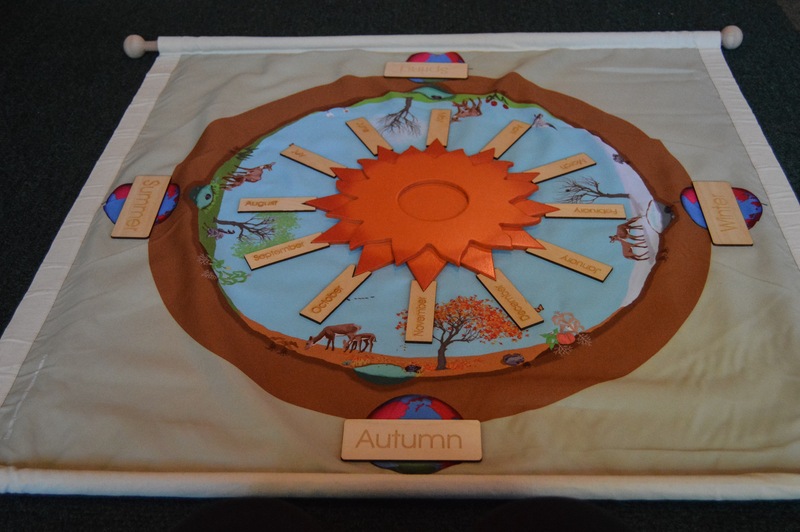 Quentin has used our Seasons mat and Sun every day when he gets home from school. He loves examining the subtle changes in the different seasons and singing the months of the year song. It is a beautiful material that takes time and care to use. I think this grounds him after a long day. Autumn happens slowly in our part of the world. We don’t have the drop in temperature at night and frosty mornings that the rest of Canada does. It makes it a littler harder to admit that summer is gone. I have a post in the works for our favourite Autumn themed books and would love you to share any that are your favourites.